This is like one of those Web Anime shows on Nicodouga. Each episode is only 3mins long, including the intro song. If you can introduce characters and make them interesting in less than 3 mins then you are doing something right. All three episodes so far have been adorable. The upside to web animes is that alot of thought was put into the script. the downside is, well, the animation is lacking. The animation is simple and the backgrounds are plain. Though that is not a bad thing in itself, just a budget constraint. In summary, you should watch this show as it does cuteness the right way. btw, mukuchi means like silent or reserved. I love everything about this. I love the girl who never speaks, I love the girl who only speaks, I love the shy one, and I love the two pervy guys they cut too occasionally. This is another of those short and sweet animes. Hope you have a premium membership, because otherwise the commercials will be longer that the actually episode. However each episode feels like its cut from the same cloth as Lucky Star. Because of its heritage there is no story here, but there doesn't need to be. From what I've seen so far, I will definitely spend the next hour tracking down the ova for this series released earlier this year. The best thing you can watch in 3 minutes! 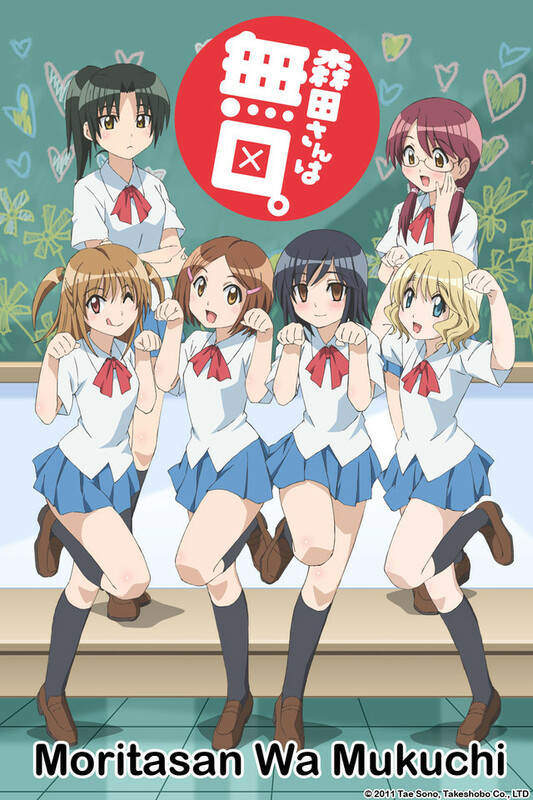 This has to be one of the most adorable anime titles I have seen in recent memory. Stuffing in all in 3 minutes is amazing. The characters are great, the animation is perfect for this type of show. Watch it now...you're missing out. Cute girls doing... Pretty much nothing. Cutely. Unlike many people, I absolutely adore short-form anime (and 4-koma adaptations in all forms). In most cases they're cute, funny and go straight to the point and when paired with good enough writing can still be very memorable and build interesting characters. Very often, such series uses pretty mundane settings and situations to deliver amusing gags or cute interactions between characters. This one probably took that premise to the absolute extreme - set in high school, with a pretty typical cast of characters and relaxed storytelling, it's most likely the slowest and at first glance most unassuming short I've even watched. But, in a strange way, it works - it's just as relaxing and amusing as you would want this kind of show to be. This is in part thanks to the adorable, shy protagonist Mayu, who never actually speaks, but her thoughts are voiced by (great as always) Kana Hanazawa. The music, artstyle and writing all support the charming, cute nature of the story. In many episodes there's barely anything happening and sometimes they end abruptly, but they just make you smile regardless. It's definitely not for everyone, but if like this kind of slow, relaxed anime, this one is a small, but delicious treat. An amazing short anime series. This series was simply amazing full of warmth that made you want more, it had its funny yet sweet moment, it made you fall in love with the characters so much. It may be a short series but I have to say that this was an interesting series, I would love to see more and it is well worth the watch. It is an amazing slice of life I highly recommend it. Perfect to watch when relaxing with a cup of tea. Its cute, funny, and overall, something that is recommended to most. Its very worth checking out atleast, it has its good and bad parts. If you're a fan of cute and funny, this is definately something you'd want to check out when you can. A 9/10 Anime in my opinion, the music and story wasn't very interesting or special, but the animation and characters was excellent.